Santoor Ariste Dr. Varsha Agrawal in Chittorgarh from 27 August-1 September for Government Institution. Interested may call at 9414307004 -J.P.Bhatnagar for inviting her in your schools. Dr. Varsha Agrawal is the one and only female artiste of Sufiyana Gharana from India who has received international recognition for her brilliant performance on Santoor. Santoor is rare musical instruments of Kashmir and to find a female artist playing on this is rarest, Dr. Varsha Agrawal is a dedicated Santoor player who displays remarkable genius. It is really a great pleasure listening to her performance. Her audience is always spellbound when she reaches the zenith of expression during her performance. Jhalawar is the place where the childhood memories of great Sitar player, Bharat Ratna Pt. Ravi Shankar have been fondly cherished. Dr. Varsha, grand daughter of renowned Physician of Rajasthan Dr. Kalyanmal Agrawal, belongs to Jhalawar. Dr. Varsha is an emerging Santoor Player of Sufiyana Gharana. She is one of the most brilliant young artists of Santoor. She has been continuously performing on Santoor in various cities of the country & abroad. She has polished her art by strenuous training and ‘Riyaz’ and has won appreciation from audience all over the country & abroad. She started learning Vocal & Tabla at an age of six from Shri Elahi Bakshji Jhalawar & Shri Girdhari Lalji Dangi, Ajmer (Raj. ), since then she has been learning Vocal, Tabla & Santoor under the able guidance of Pt. Lalit Mahantji Ujjain who is a renowned Tabla Artists of Banaras Gharana and a leading disciple of Padmavibhushan Pt. Kishan Maharajji, Varanasi and Lt. Pt. Riz Ramji Desad, Mumbai of Delhi Gharana. 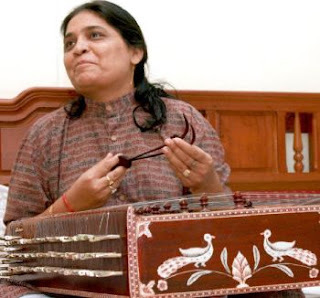 At present Dr. Varsha is the ‘Gandabandh’ disciple of renowned Santoor player, Saint of Santoor, king of strings Padm Shri Pandit Bhajan Sopori ji. She is associated to AIR and Doordarshan. Her interviews & performance have been telecast on Sahara Samay T.V. Channel. A number of ragas on Santoor have also been telecast on Doordarshan. She is lac member of air. She has got top grade on the feature written by her for AIR. She has also done Sangeet Bhusan, Sangeet Prabhakar Vocal, Sangeet Alankar (Tabla), Master of Arts (Vocal) in First Division with merit. She was awarded Ph.D. on the subject of ‘Hadoti Ki Lok Gathavo Ki Gayan Parampara’. At present she is working as Professor in Music Department, Govt. Girls’ P. G. College of Excellence, Dashera Maidan, Ujjain. Affiliated to Vikram University, Ujjain. Ujjain is a holy city famous for lord Mahakaleshwar Temple. It is the Sikshasthali (seat of learning) of lord Krishna . She has been recognized as a guide for Ph.D. research work in Music by Vikram University, Ujjain and many students are doing research under her guidance. Many Bandishes, research Papers have been published by her in Sangeet Masik, Shodh-Samvet, research link etc. Honored by Madhya Pradesh Governor H. E. Dr. Balram Jakhar in Raj Bhawan. 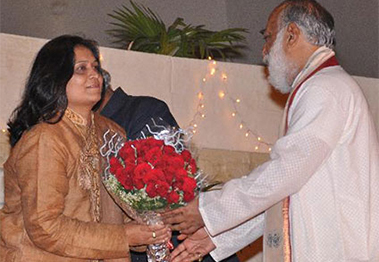 Dr. Varsha awarded with "Hari Om Trust Prize" in 1998 at Hyderabad.